Plastic handguards w/ integrated LED turn signals, easily mounts to any aluminum handguards. Pre-wired with factory KTM connectors. Lens Flat mount LED turn signals with the factory KTM connectors for a direct plug unit. Mounts to any flat surface using a through screw. 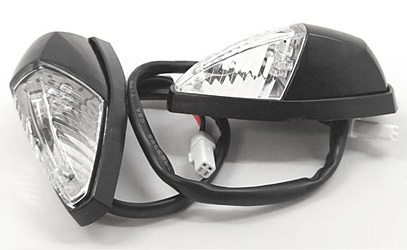 Ultra-brite LED turn signals with flexible mounting and the KTM factory connectors for direct plug in installation. Includes a small window on the tip of the turn signal for increased visibility. Shaped similar to the factory KTM EXC turn signal only smaller and more flexible. These turn signals are "E" marked. New XCW EFI lighting kit is even easier to install. 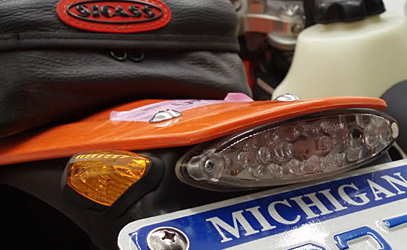 SICASS racing's lighting kit with turn signals for the EFI equipped 2012-13 4-stroke XCWs puts to use the items you already have, the kit plugs directly in to the existing head light and tail light saving you time and money. This kit ties into the existing relay system on the bike and turns off when the relay times out so there is no chance of battery draw when the bike is being stored! If your new LED turn signals are flashing like a four way flasher and you have access to the wiring of the dash board turn signal indicator then this is the fix for you. 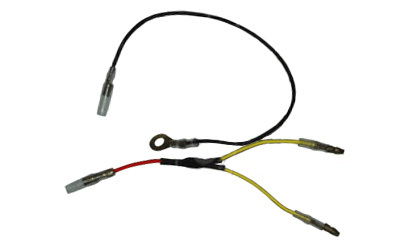 When running an all LED turn signal system we have found that the KTM EXC's back-feed through the OEM indicator, this wiring kit corrects this issue and allows you to run LED turn signals and still use your stock turn signal indicator that is located on the dash board. Smart turn signal flasher works with ALL types of turn signals, including LEDs. Clean up the look on the front of your bike with our plastic hand guards with integrated LED motorcycle turn signal lights. Easily mounts to any aluminum hand guards. 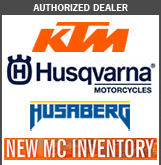 Looking for the perfect hand guards to mount these to? Check out the Zeta Armor Pro Bend Guards Here. The holes to mount the deflectors are pre-drilled. Pre-wired with factory KTM connectors. 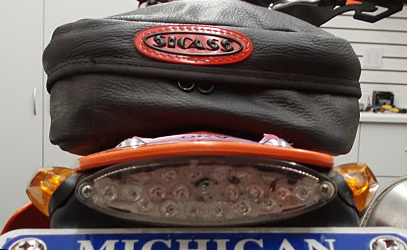 NOTE: IF INSTALLING LED SICASS RACING TURN SIGNALS ON THE FRONT AND REAR OF YOUR BIKE YOU WILL ALSO NEED THE SICASS SMART FLASHER, PART #22-300. 4-stroke XCWs puts to use the items you already have, the kit plugs directly in to the existing head light and tail light saving you time and money. This kit ties into the existing relay system on the bike and turns off when the relay times out so there is no chance of battery draw when the bike is being stored! 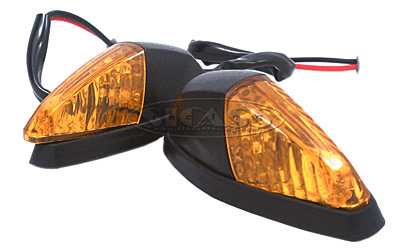 SICASS racings smart turn signal flasher works with ALL types of motorcycle turn signal lights, including LED's. This will NOT work on KTM 690's. You need to install SA-22-690 instead. *If you plan to use LED turn signals on the front AND rear, then you will need to use the smart flasher and SA-22-299. *If running one set of LED and one set of standard bulb turn signals you do not have to install the smart flasher, in this case the turn signals will blink slightly faster. If you wish to correct the flash rate install the SA-22-300.